Ever wonder what story is told by the food on your plate? It’s all explained in the show at the American Museum of Natural History, Our Global Kitchen: Food, Nature, Culture, now in its final weekend. It’s a fascinating walk-through of how food is produced, transported, and consumed by cultures all over the world. 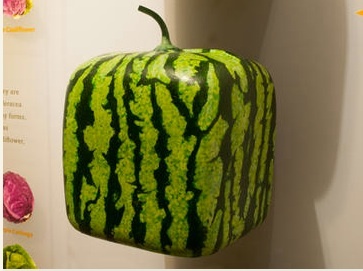 You’ll see examples of the zillions of varieties of potatoes archived by the Peruvians high up in the Andes and interesting twists like cube-shaped melons grown in Japan. What’s everyone’s favorite part of the show? Most people can’t get enough of the interactive light table where you can watch the hands of master chefs making some incredible ethnic dishes and the Aztec market. 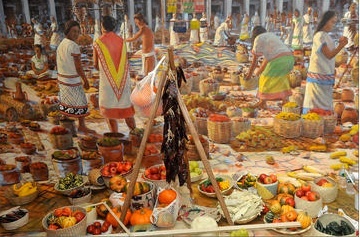 The latter is a full-scale diorama of what shopping was like in 1519 down in Mexico City just before the conquistadors arrived. The market is vast, with an amazing array of items, all neatly arranged in sections, not unlike Eataly’s adventurous stalls near Madison Square. You’ll get a glimpse of what was on the table of Gandhi, Roman royalty, the Great Khan, and other historic celebrities. The best is seeing what Otzi, the mummified Ice Man was packing as he crossed the Alps about 5,000 years ago. Here’s the informative introductory video for this thought-provoking and mouth-watering show. This entry was posted in History, Museums, Nature and tagged culture, food, history, marketing, museums, nature, science, video by mssusanb. Bookmark the permalink.